The International BBQ Network have announced that Harry Soo from 'Slap Yo Daddy' is going to be putting on 2 BBQ courses on the 14th & 15th July, the very first time he has run his course outside of North America! 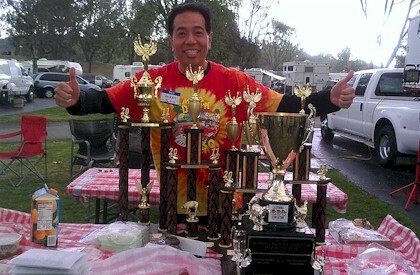 Harry Soo is one of the US's most successful pitmasters with 22 Grand Champions (ie wins) in 4 years, making him and his team one of the most prolific winners in recent history (he was a firm favourite in the 'BBQ Pitmasters Series' on the Discovery channel. In a no holds barred session, Harry will be imparting his BBQ techniques and tricks to the class. BBQ Fanatics have already registered their interest and cannot wait for this session! !